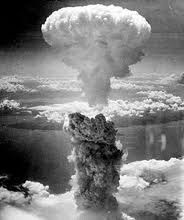 On August 6 and August 9, 1945, at Truman's order, the United States dropped nuclear bombs on Hiroshima and Nagasaki, respectively. As many as two-hundred and forty-six thousand people died as a result: soldiers, civilians, men, women, children and little babies. How can I offer any comment? During the Korean War (in which our soldiers were equipped with battered and rusty rifles from the previous war), General MacArthur proposed dropping nuclear bombs on North Korea in order to end the spread of Communism and to achieve the objective of the campaign. He was removed from command by Truman. I never have trouble sleeping, but when naked, bone-melting horror presents itself, the nights are very long.